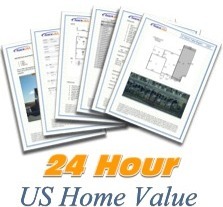 Fast appraisal emulations for homebuyers and homeowners. real estate databases for professional analysis of subject property data and sales comparables. US Home Value is an affordable alternative to spending hundreds of dollars on an appraisal when trying to assess buying or selling residential real estate. We are not pretending to offer an official appraisal sealed by a licensed appraiser for less than $40. However, a US Home Value report uses much of the very same data relied upon by licensed real estate appraisers to estimate property values. Better than an automated valuation provided by online websites, our report is manually reviewed and prepared by an actual processor. Rooms, Living Area, Lot Size, etc.